Mice, in general, tend to get a bad reputation as being disease infected rodents that do nothing more than ruin our homes and spread illness. Although there are some down sides to sharing your home or barn with a house mouse, they can also be quite beneficial, especially to humans. For starters, there is their obvious usefulness in laboratory settings. 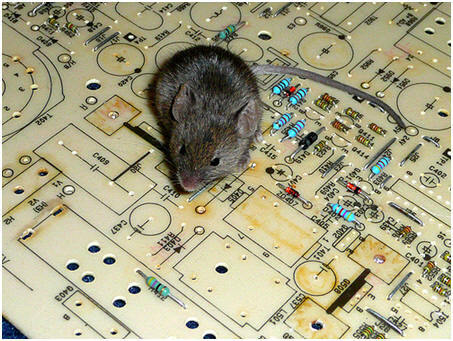 Many mice used in labs around the world are derived from the species Mus musculus. They make ideal organisms for studies in many science fields such as genetics, biology, and medial research. They are also quite helpful when they inhibit fields as well. What food they do eat is generally just what they find on the ground, but they also eat many weed seeds that could otherwise reduce the growth of the crops. Also, they do a bit of insect control by eating the larvae. Of course house mice can also be harmful to humans. Once they enter our habitat they feed on our food, be it grain for our animals or food meant for ourselves. Their gnawing habit can also do quite a bit of damage to our homes. Though rats are more of the culprit for diseases spread to humans, mice are also capable of this as well. Mice harbor relatively few fleas, but the fleas they do carry can transmit diseases such as Rickettsial Pox to humans, yet it is very uncommon. We commonly think of the house mouse only in terms of how it affects us, but there are interactions with other organisms in the wild as well. For example, mice are a host for some parasites as well. Many house mice studied contained a variety of nematodes. Also, although fleas are not abundant in this species, mites can be found on them in greater numbers.